Helping Canadian businesses beat the odds! Tax will likely be your biggest expense in life, outpacing the costs of your home and vehicles many times over. Good tax planning takes time, but the costs are often insignificant when compared to the additional tax incurred as a result of poor planning. Business plans are an essential mechanism to mitigate the wide variety of risks you are likely to encounter. It’s difficult for the average business owner to develop an effective plan on their own, as they tend to focus on their areas of interest, thus leaving the other potential pitfalls to chance. Further most business owners simply have not been involved in enough businesses to consider all the unforeseen circumstances and how they change over time. This increases the risk of losing significant personal assets invested or used to secure the business, and years of your life to a failed venture. At Spurrell & Associates planning is not something that we occasionally do occasionally because we want our clients to succeed regularly. Thus we are efficient and proficient in issuing formal financial and business plans that will maximize your success. The annual financial plans and business plans issued by Spurrell & Associates puts the business owner in an excellent position and take advantage of the wealth accumulation strategies while growing their business. Computer based automated accounting systems are significantly reducing the time necessary to do many of the tasks that were previously labour intensive. We believe hourly billing arrangements reduce the motivation for accountants to spend time on learning and implementing new systems. Further, hourly billing arrangements cause clients to exclude the accountants from important decisions, in an attempt to minimize fees. As the lack of professional guidance is one of the main reasons for business failures or inefficiencies, we believe hourly billing contribute to business failures all too often. At Spurrell & Associates, we are firm believer in flat monthly fees. We invest in researching and implementing automated systems when possible to reduce the time spent doing low value data entry tasks, thus maximizing the time we have available to help clients achieve their strategic objectives.We offer a free consultation to learn about your business, provide some initial guidance, and quote how we can help you move forward. Reliance on manual data entry creates significant costs and time delays in delivering low level information. Today’s accounting software has the ability to automatically post transactions by connecting with your bank or automatically importing other source documents. Web or app based timesheets can be setup for employees and this information can be automatically populated to the accounting software after approval and even checked against GPS records. At Spurrell & Associates we are diamond level QuickBooks Online by Ituit and have several team members who are certified advanced ProAdvisors. We provide access to our web based QuickBooks Online data files at no additional cost. This gives the business owner up to date reliable information to record and make key business decisions effectively. The challenges of your business and the landscape in which it operates in will change over time. New issues will arise in the business as you grow, tax laws will change, and the technology available to you will update. At Spurrell & Associates we are committed to learning and refining our processes to give our clients the edge. Further we have and continue to utilize the most advanced technology available to maximize performance in your small business. Finally, with a 10 person team we have sufficient capacity to stay on top of new technology and providing leading recommendations to our clients. Some accountants are not setup to do more than year end accounting work. Often this causes the business owner to rely on individuals who do not possess the same training or experience as a Chartered Professional Accountant. Thus the business owner will be forced to make decisions without having up to date numbers from a reliable accounting system and without receiving guidance on a variety of options. Also the reliance on one or 2 undesignated staff normally creates internal control weaknesses and is one of the main cause why so many small businesses are subjected to fraud. At Spurrell & Associates we can help with starting even a one person business and scale up our services as you grow. As the business grows we are fully setup to provide a turnkey professional outsourced accounting department solution. Thus you get up to date information to make business decisions and analysis on your options as you progress. Our goal is to provide small businesses with the same advantages that larger businesses who can afford CPA’s on staff have. Often given our proficiency, our professional guidance is cheaper than the alternative of hiring someone who is going to learn on the job. Often small clients are shuffled between staff in a firm depend on availability. This causes a lack of understanding of the client and their objectives. This can result in inefficiencies and even back advice. At Spurrell & Associates we assign even the smallest of clients to one of our 2 person teams. This ensures that even with holidays or staffing changes, that you are always dealing with someone who is familiar with your file. Business owners are busy. Although it is wise to spend time on discussing strategic initiatives, it can be wasteful to spend unnecessary time on low value tasks. This includes travelling, preparing cheques, accessing information, and signing documents. 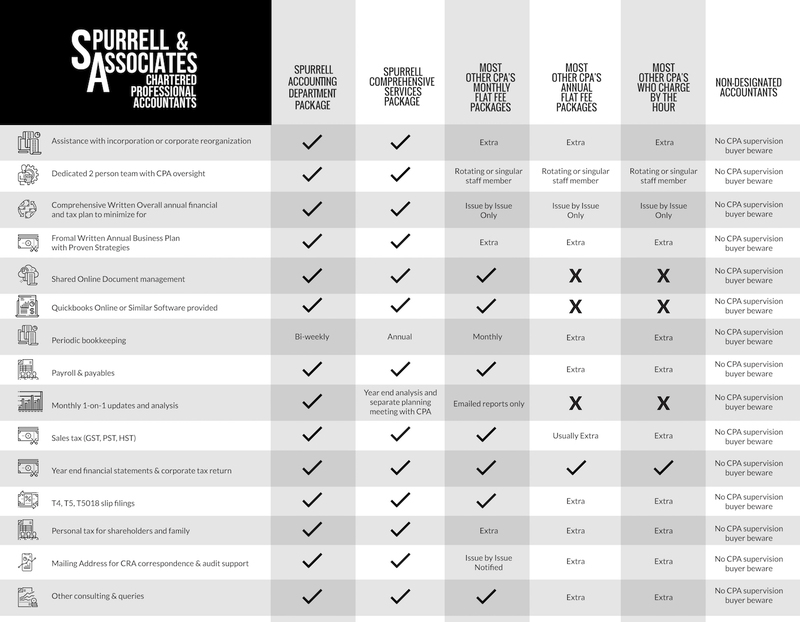 At Spurrell & Associates we have a variety of tools that help you operate efficiently. This includes online presentation and remote access software. No matter where you are, we can always have an effective meeting. We have software to securely approve and disburse funds electronically. We maintain an online database of all your records, that can be accessed with any computer or smartphone. Finally we use digital signature software, so you can sign documents quickly from anywhere.